Isaac Asimov was a prolific Russian-born American author of popular science and science fiction. He published about 500 volumes and is probably best known for his Foundation trilogy (1951–53) and for his short-story collection I, Robot (1950) in which he developed a set of ethics for robots. Asimov received a doctorate in biochemistry from Columbia University in 1948. He later joined the faculty of Boston University, with which he remained associated for the remainder of his life. Among his books on science are Inside the Atom (1956), The Human Brain (1964), The Neutrino (1966), and Our World in Space (1974). 1. Asimov, Isaac. Extraterrestrial Civilizations. New York: Crown (1979). 2. Asimov, Isaac. The Gods Themselves. New York: Fawcett Crest (1972). 3. Gunn, James. 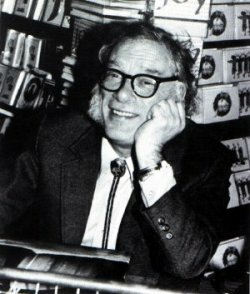 Isaac Asimov: The Foundations of Science Fiction. Oxford: Oxford University Press (1982).